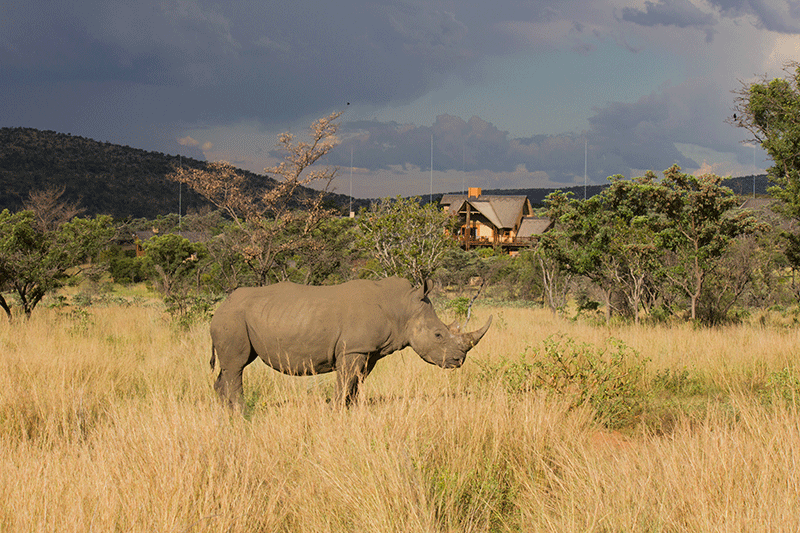 KOLOLO GAME RESERVE Situated in the Limpopo Province, in the heart of the Waterberg biosphere, Kololo Game Reserve is the perfect safari destination: malaria-free, child friendly, Fair Trade Certified and home to a large variety of game! Partially integrated into Welgevonden Game Reserve, Kololo offers the Big 5 experience in combination with accommodation in a luxurious lodge where only safe game roams free. The private gate near the reception offers direct access into Welgevonden Game Reserve. Discover the wildlife from the comfort of your private terrace, enjoy a drink on one of the viewing decks in the restaurant with beautiful views on the Big 5 area or explore the Big 5 from up-close during a guided Welgevonden game drive or bushwalk into Welgevonden. Guests are free to explore Kololo’s walking trails either on foot or by mountain bike, with the Big 5 safely behind the Welgevonden fence. OR Tambo International Airport, Johannesburg – 3,5 hours drive. Closest major city Johanesburg is at 3 hours drive. Special SA Resident Self Catering rates until December 15th, 2018 – 2-sleeper: R 1900,- per unit – 4 sleeper: R 3400,- per unit – 6 sleeper: R 4800,- per unit Activity package: 1x Welgevonden Big 5 Gamedrive R 375,- pp, 2x R 325,- per drive pp, 3x R 275,- per drive pp. Curios shop also selling light snacks (chips), drinks and ice cream. There is a restaurant at the property where guests can have breakfast, lunch and dinner. The restaurant serves 3-course meals with a choice of 2 main dishes. Wines etc. available. Warm Clothes & Summer Clothes • Swimsuit • Tracksuit • Running Shoes • Warm Jacket / Jersey • Slippers & Slops • Gym Clothes • Hat NOTE: Our dress code is very casual. Gowns and towels are supplied. In winter, the temperature varies from -2 to 22˚C midday, so please pack accordingly.